Registration for Mill Creek’s 25th annual Run of the Mill 5K road race is now open. Although registration is open until noon on July 4th, those who register before July 1st save $15. There is NO day of race registration, so register early! Participation is limited to 2000. The Run of the Mill is both fun and competitive. The Pacific NW Track & Field Association has selected the Run of the Mill as their Open and Masters 5k Road Race Championship race. As always, runners of all ages and abilities enjoy the race because of the camaraderie and great community spirit before, during, and after the race. Additionally, the Washington State Cross Country Coaches Association will run their annual East/West All Star Race right before the main Run of the Mill race. This is a big honor, and will add even more excitement to the Run of the Mill. Approximately 160 high school senior All-Stars from across the state will participate. The Run of the Mill raises money for cancer patients who are undergoing treatment as well as other local charities. A secondary focus is providing financial support to youth sports, especially high school running programs. The goal is to raise $50,000 this year. When they register, participants can make additional donations designated for their choice of nine local high school athletic teams or charities. Supporters can make a donation to your fund even if they don’t want to register for the race. St. Vincent de Paul – Bothell/Mill Creek Conference. Steve Knox is the organizer and main sponsor of the Run of the Mill. He took over the Run of the Mill in 2006 when the previous organizer was ready to pass the torch. He solicited support from the running community, and with help from some amazing volunteers, the Run of the Mill took on a new life as a charitable event. 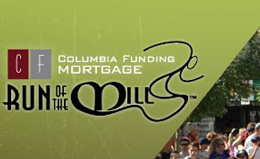 Knox is the owner of Columbia Funding Mortgage, located in the Mill Creek Town Center. He enjoys recreational running, and actively supports high school running programs as a founding member of the Jackson High School Track and Cross Country Booster Club.